Today, or just a few minutes ago got one more lesson on Shraddha meaning Faith and Saburi meaning patience. 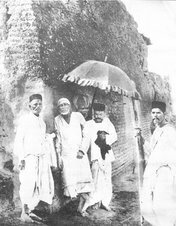 One similar incident, which happened long time back is mentioned in the first experiences with Shirdi Sai Baba. The intellect and mind were silent, it became the goal. 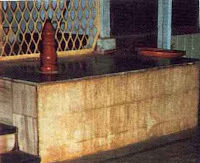 As already described in previous post, one gets powerful vibrations or grace or what ever one may name it from the shawl, consecrated at Samadhi Temple, Dwarkamai and the stone on which Sai Baba used to sit, tied on head and Shri Sai SatCharitra in hands. Those two highly charged sacred object became constant companion, leaving some routine work of cleaning the body. Awareness was on the energy emitted through it. Most of the time it gave the feeling of body and mind fully charged with it, with some occasional disturbances in mind. The essential goal was that the intellect and mind gets silenced by the sacred energy felt. 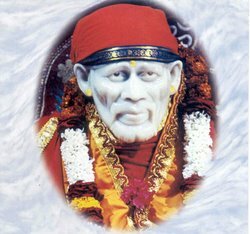 May a times each thought was read and discarded, no the thought cannot be true, Oh Sai give me the truth which the thoughts or intellect cannot conceive. There were some other activities with the awareness on the energy, reading spiritual books on the lap top, so that both the hands can hold Shri SaiSatCharitra ,and the grace felt through is not missed. Also low volume chanting of SaiBaba Mantra would play. Wrote the previous post on this blog and a Zen Story, on blog containing inspirational stories. One of the books was The Wayfarers one can download other Meher Baba books from ambppct.org. This books describes the work of Meher Baba with Masts. Masts are the spiritually advanced people, who for the love of God have made intense search for God without help or guidance of a Sadguru like Sai Baba. They achieve a higher spiritual state, they are divinely mad stationed at higher realms of life and quite beneficial to humanity. Outwardly to the normal person, they might appear mad due to their outward behavior. Mind slowed down, is mast. Mind working fast, is mad." What i wanted to put on this blog while reading the book was the types of Masts described. 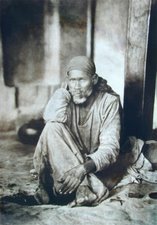 The first two types characteristics, most were shown by Sai Baba of Shirdi, though he showed much, much, more than the following two types. A jalâli mast is always hot-tempered, abusive to others, and talks at random. He is restless, and beats those who come near him. He is almost always dressed in rags, and lives in an environment of filth and squalor. By day, he occasionally roams hither and thither, and at night, although he rarely sleeps, he lies down usually in a particular place. When awake, he prefers to recline in a half lying posture, and occasionally rests his head on one hand. He has a habit of constantly moving his fingers and toes to and fro, has a passion for tea, and is moderately fond of tobacco. He never asks for gifts except tea and tobacco. If given clothes, money and so forth, he at once throws them away; and though he will accept food when hungry, he may throw it away if not hungry. He is happy in crowded streets and bazaars, and sometimes enjoys the company of dogs. The presence of small children annoys him. A jamâli mast is always mild-tempered, and he never abuses or beats others. He speaks often in riddles, and often at random. At night, he almost always remains in a particular place, and by day rarely moves about, doing so only when absolutely necessary. When a jamâli mast sits down, he prefers to be on something raised from the ground, so that his legs dangle. He typically moves his fingers and hands most of the time, and occasionally makes signs with one or other of his fingers on the ground, on some convenient part of his body such as his thigh, or on any object to hand. He has a passion for tobacco, and is moderately fond of tea. He never asks for anything from anyone except tea and tobacco, but if given anything he keeps it. His favourite environment is a room, and he loves music." " In this beggar's hands the conflicting forces of the world's turmoil and the throes of the universes were kept balanced! It may be difficult for a worldly-minded materialist to believe this, but it is a spiritual fact. If people were told this peculiar holy man was responsible for conducting or controlling the First World War, they would say it was ridiculous. But in the inner realms of spiritual realities, the Qutubs or Sadgurus are the Masters of the universe and nothing ever happens without their divine ordinance." 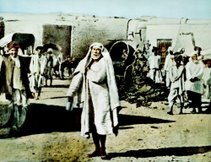 Sai Baba during those periods would scatter all the parts his body in Masjid, to feel and take the pain of the wounded soilders. Where can one find such compassion? 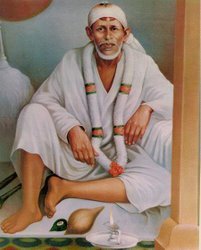 Coming back to the author's story, today awareness on energy in the company of sacred shawl and the sacred text, Shri Sai SatCharitra, took unfavorable turn for my head and system. The mind was getting too much disturbed, primarily for the way people behave, how people use each other not minding much for the other, for their own selfish motives. The disturbance, one thought would subside took to a new vigor. The head was unable to bear the pain. Like a zombie i looked staring at the wall lying on the bed. 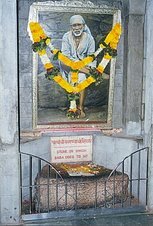 Than took the decision to watch Sai Baba's picture. As mentioned in few previous posts, the picture is responsive (one will find many of these responses with various devotees if one reads their experiences with Shirdi Sai Baba). The picture seemed to move with immense compassion in His eyes, the hand in blessing posture seemed moving as if pouring blessings. It was like " Why fear when I am with You." What followed did not convince the mind first. A thought began to vibrate "Leave the shawl and the book for a day". I said, "How can it be Baba? This are you, i can feel you so strongly through these." This happened a couple of times. Baba seemed to say to me, " Do you remember the incident?" 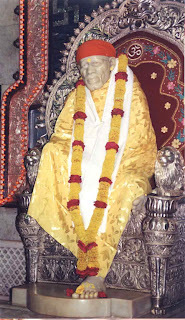 The incident that came to the mind was of one man who coaxed much to Sai Baba, to make him a highly spiritual person. Being coxed much, Sai Baba once swung his hands towards him as if he was throwing a ball towards him. Since than, the person acted as deranged. Sometimes speaking words like Sai Baba does. After few days, his relatives and well wishers prayed to Sai Baba to do something about his deranged state of mind. 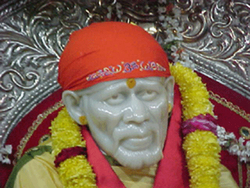 Sai Baba, then swung his hands as if taking out the ball from him. The man came to the senses, to which, the society accepts, and never again coaxed Sai Baba for instant nirvana. The message that mind got was " I am with you even when you are away from my blessed objects. The purpose of the blessed object is to make your meditations easy, I work on your head and your karmas and sanskaras(subtle bodies one has, according to deeds). You surrender, I work. But your system must also have the capabilities. Other wise what happened to the coaxer can happen to you, so my child put them away for a day, let everything settle and move ahead with my blessings. I parted with the sacred shawl and the sacred book, somewhat reluctantly. Whole of the body was vibrating, the hair on the body stood on the hands. One felt much energy was emitting from the head. After couple of walks inside the home, i sat down to write this post. 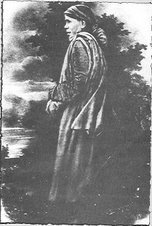 "It is, therefore, better for one to take only what he can digest and assimilate. My treasury is full, and I can give anyone, what he wants, but I have to see whether he is qualified to receive what I give. If you listen to Me carefully, you will be certainly benefited. Sitting in this Masjid, I never speak any untruth."